Fanny Bay were had at the "Crab Catcher" in La Jolla, CA on 3-15-12. Medium size, meaty at $20/doz. Had some Carlsbad CA local oysters - not recommend. Slightly milky in mouth feel. Large and vegetal in flavor. Local water was about 56 degrees, relatively clear. Eaten at sushi bar which was otherwise outstanding. A dont-miss: Sushi Ota - outstanding hamachi, aji and toro. Want your photo posted on our blog? 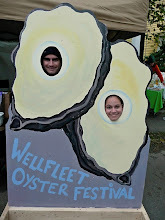 Send it to josh@goshuckanoyster.com for consideration. Please include a story of the oysters you are enjoying in the photo.